Maruti Suzuki Baleno ‘s brand alliance with ‘Batman V Superman’ has hit the news already. The film Batman V Superman: Dawn of Justice released across 1400 screens in India on Friday, 25th March. The film has been dubbed in three Indian languages – Hindi, Tamil and Telugu. Yesterday, as a part of Maruti Suzuki Baleno campaign I drove ‘ Batman V Superman’ edition Baleno in Delhi and whoever spotted the car was given Batman V Superman: Dawn of Justice movie tickets and/or Shoppers Stop shopping voucher for free. Yes, for free, absolutely free! Imagine how awesome it is to see the special edition Baleno and get Batman V Superman couple movie tickets or a Shopper’s Stop shopping voucher for free. Wondering why did you miss it? It was quite an entertaining experience. The shiny bold car was hard to miss for passers-by and the car is an absolute delight. People were really enthusiastic and the Baleno is already very popular among the youngsters, which of-course was not a surprise. 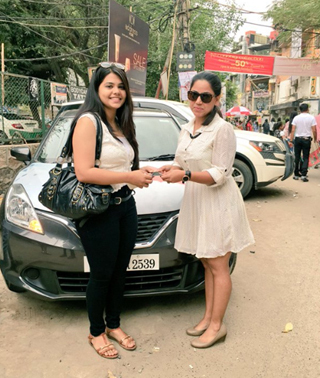 We started our journey in the eye catchy Baleno from PVR Saket Market and the response was phenomenal, we gave away few tickets in Saket before we left for Haus Khas Village. Wherever I drove the car, all the eyes were on me or rather on the car as people were enthusiastic to get a picture clicked with the Batman V Superman Baleno. People reached out to us on red lights as well to get a picture clicked, it was truly a super star feeling for me. Then we reached our next destination that was Haus Khas Village, popularly known as HKV. That is one of the places in Delhi which is always crowded, whether it is a weekday or a weekend, afternoon or night. We just parked our car at the market entrance gate and people started reaching out to us. Our journey concluded at Rajouri Garden Market, as we reached it was dark but the craze after noticing the car was not less in people. People were equally excited to get themselves clicked with the car. 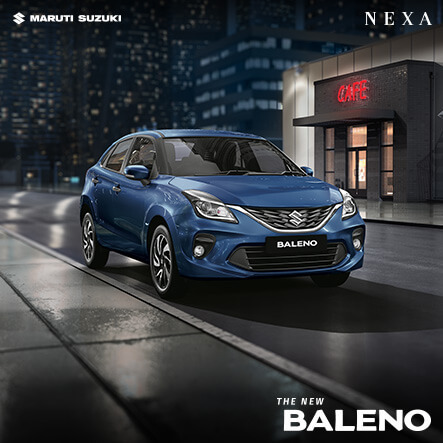 Baleno is a premium hatchback car by the country’s largest car maker, Maruti Suzuki premium offering NEXA. 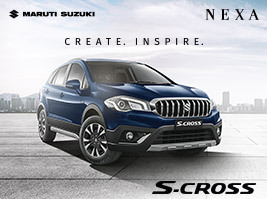 Maruti Suzuki has launched a new brand for its high end segment cars under the name of NEXA. It was launched in India in the last week of October 2015. The car has been in high demand since then. 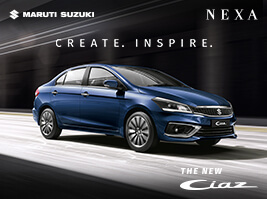 With over 100,000 bookings in less than four months, the car is loved because of it style and price tag ;). The price for the car ranges from Rs 4.99 lakh to Rs 8.11 lakh. The car is offered in four trims. The premium hatchback category is quite an appreciated category in India. Around 5,00,000-5,25,000 cars in the premium compact category are sold every year. 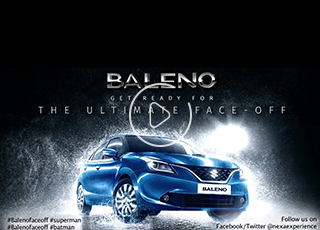 The association of Batman V Superman with Baleno is just perfect. ‘Made of Mettle’, the tag line of the Baleno sums up the aptness of the association quite well. The Baleno’s design is symbolic of boldness, masculinity, edginess, aggressiveness and defiance. Batman and Superman are known for similar traits. 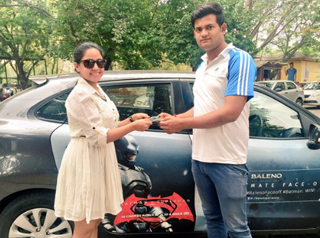 The target audience of the Baleno and superheroes comprises the youth. Obviously, all these traits are very popular among the youth today. With such boldness and edgy association, the popularity of the car has increased multi-folds. 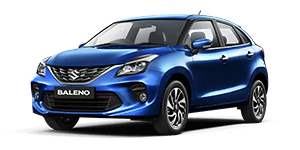 Time and again, in different ads the Baleno has been personified as someone loaded with attitude, ensuring that it leaves nothing short of proving its mettle. An appropriate fit for the urban audience who wants lots of excitement and aggressive experience from their vehicle. The car is available at the NEXA showrooms.